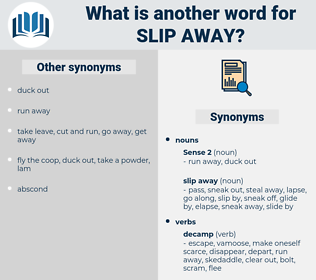 What is another word for slip away? come in, stay, enter, arrive, wait. combine, come, join, linger, keep to, occupy, persevere, remain, continue, fill. capture, take on, walk, assist, appear, encounter, stand, aid, accept, help, confront. decelerate, delay, dawdle, dally, rest, slow, land, procrastinate, stay on ground. mismatch, break, disagree, surrender, create, be born, stop. achieve, win, hold on to, maintain, succeed, keep. fall behind, cease, live, decline, miss, fail, refuse, halt, rush, be willing, use, lose, hold, take, decrease, deny, receive, veto, get. 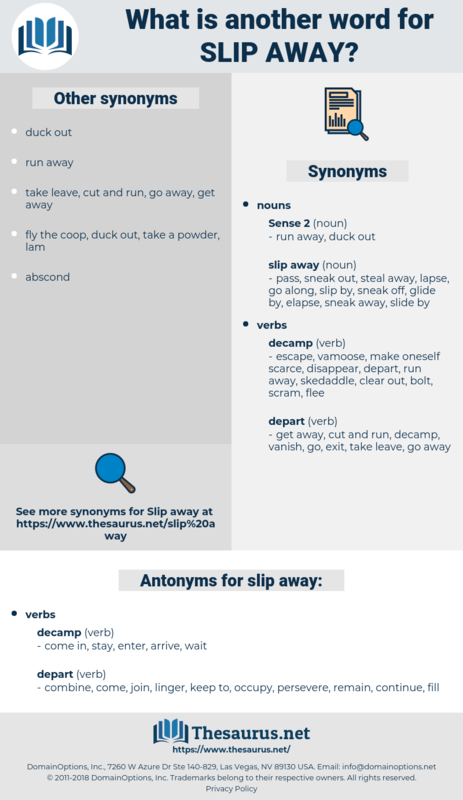 sexual love, slavey, slav, soil pipe, slipway, scollop, silva, scalp, slaphappy, sell up, salp, social phobia, slope, slop, schoolboy, salvo, ski slope, self, slippy, selva, sleep off, shelvy, sleepy, sloppy, salvia, seal off, sea wolf, slip-up, solfa, scale up, syllabify, slab, salve, shlep, slap-up, salpa, sea scallop, scale leaf, sillabub, shelfy, solve, skylab, sick leave, silvia, sloop, slip by, sylph, slip off, schlep, swell up, slow up, slave, sleeve, sulpha, sulfa, sell off, sleep, sylva, solvay, shelf, saliva, slip up, scallop, slob, shelve, slip, swallow up, slub, sclaff, selloff, syllabub, slap, school phobia. leave, go away, go forth.